“Where are the Wild Ponies? 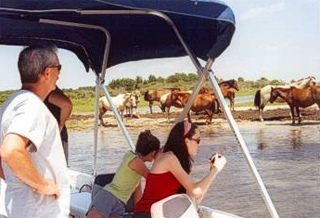 '” Since 2001, the Pony Express Nature Cruise has provided the best opportunity to observe wild ponies along the boarders of Assateague’s extensive calm western shoreline. Departs from Curtis Merrit Harbor Slip #69. We look for ponies, dolphins, eagles, shorebirds and more along the National Wildlife Refuge at Assateague. Visit remote regions along the islands. Enjoy a sunset wildlife cruise for a spectacular bay experience and a close up view of the Assateague Lighthouse. Our newest 40′ twin engine tour boat is a U. S. Coast Guard certified passenger vessel and very stable. All of your family and friends can stay together on our boat. This boat is 12′ wide with large high-speed catamaran style hulls, providing a smooth ride, high off the water. The boat is equipped with a restroom and a large top for shade. We have three tour boats in our fleet. Kayak tours and rentals are also available. Sit back and relax as you travel the maze of pristine waterways from our dock. Package deals, custom trips, private charters, group and children discounts. 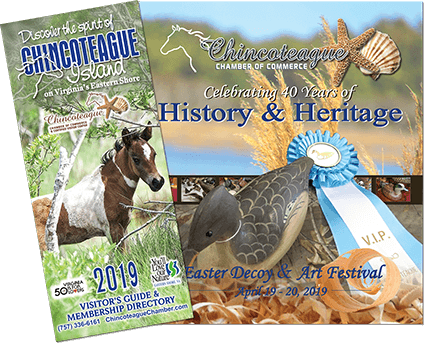 Departs daily from Chincoteague Island, VA. Be sure to call ahead for reservations. Excursions guided by a boat captain and former Park Ranger for the National Park Service.